INDEPENDENCE, OHIO (April 01, 2019) – Kichler Lighting LLC, a leader in innovative lighting and ceiling fans, introduces an extended array of commercial-grade LED outdoor lighting solutions to the C-Series line. The expanded offering boasts durable die-cast aluminum housings with stainless steel, and tamper resistant hardware designed for ease of installation. Another benefit, the C-Series allows electrical contractors to install throughout new or existing properties, saving on time and costs. The C-Series provides 120V-277V of universal voltage and contains built-in surge protection up to 4kV. Gaskets surround knockouts and mounting plates to protect against water ingression, as does the fully potted drivers. Each fixture in the C-Series line is available in Textured Architectural Bronze – a finish that withstands the elements year after year. New small Wall Packs mount to a junction box or conduit. The fixtures feature hinged assembly, captive screws, and quick connectors for greater ease of installation. The single COB LED and downward reflector distribute light evenly from the prismatic tempered glass with limited upward light trespass. The series is available in 3000, 4000, and 5000K. The photocell is optional. Available in two wattage variations, the Wall-Mounted Area Light offers illumination to objects below. Ideal for office buildings or shopping centers, the Wall-Mounted Area Light’s LED array distributes light evenly through tempered glass. The fixture is equipped with a gasketed mounting plate featuring a built-in level and easy-reach hex screws to simplify installation. The series is available in 3000, 4000, and 5000K. The photocell is optional. The modern design of the Slim Wall Pack features a low profile with focused light delivery from its single COB LED. Often installed as a downlight, the fixture also serves as an uplight utilizing the trunnion accessory. The Slim Wall Pack is available in three wattage variations and color temperatures and comes equipped with a gasketed mounting plate featuring a built-in level and easy-reach hex screws to simplify installation. The photocell is optional. The Canopy Light is designed for outdoor ceilings and overhangs. Featuring a hinged mounting plate for ease of installation, the fixture securely hangs until wiring is complete. The single COB LED evenly distributes light through the durable polycarbonate diffuser. The series is available in 3000, 4000, and 5000K. The photocell is optional. The 2-Light Security is a 120V fixture. Its die cast aluminum housing, gasketed knockouts, fully-potted driver, and stainless- steel hardware promotes durability. 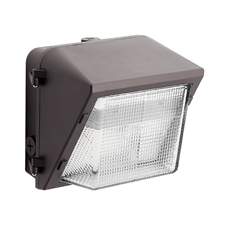 The fixture features a built-in photocell and dual sensors: front passive at 240°; bottom sensor 360°. The series is available in 5000K in both a Textured White or Architectural Bronze finish. High-resolution images of the full 2019 Kichler C-Series line are available upon request. All products in the new Kichler C-Series line have been thoughtfully designed for commercial outdoor applications. The new ceiling and wall platforms feature a five-year limited warranty on finishes and electronics. For more information, and to locate your nearest distributor, please visit kichler.com. For more information, or to view a complete listing of the DLC Qualified Products, visit designlights.org. Kichler Lighting LLC strives to transform the home and workspace by developing fixtures that perform efficiently, install intuitively and deliver an overall effect that combines style with purpose. With an extensive portfolio of more than 3,000 on-trend products – including lighting, landscape and ceiling fans – and a commitment to providing services and project solutions, Kichler Lighting is the brand homeowners and professionals know and trust since 1938. Kichler Lighting products are available at independent showrooms, Lowe’s, electrical and landscape distributors and online. For more information, visit www.kichler.com.